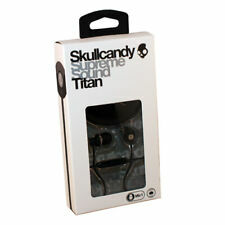 SkullCandy Titan. Discontinued by manufacturer for lasting so long. Rare Black/Black. Skullcandy Titan with Mic Stereo Headphones. Cable Type: Aluminum braided, Nylon braided. Magnet Type: NdFeB. Technical Specifications Dial in a secure, comfortable fit. Includes 2 gel sizes.